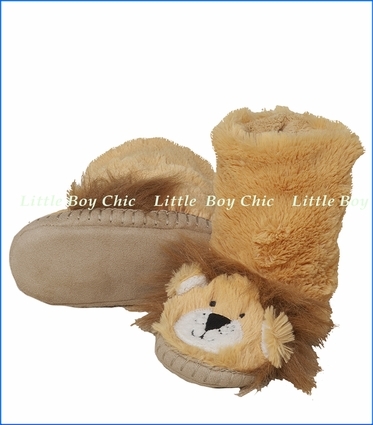 Keep his toes warm with these ultra fun Hatley's animal faced slouch slippers with microsuede sole. Fuzzy fleece with whip-stitch edging. Small is for shoe sizes 5 to 7. Medium is for shoe sizes 8 to 10. Large is for shoe sizes 11 to 13. Extra large is for shoe sizes 1 to 2.